Representation: Remnant and representative of the broad valley, glacial-fed, braided stream complex that remains in a natural condition within the Bridge River system. This ecosystem type of large Douglas-fir and valley bottom riparian conditions is rare in the area. Old river channels and extensive gravel bars, supporting extensive cottonwood stands and riparian habitats. Intricately braided river system and braided tributaries to the delta on Downton Lake. Mixed stands of Douglas fir/lodgepole pine, mostly old growth on steep slopes with occasional Douglas fir/Western white pine stands and brushy avalanche chutes. Down flow winds from local glaciers results in cold air pooling in the park area. These conditions have produced plants especially adapted to this environment. Important spring habitats and cross valley connection for grizzly bear; habitat for moose, mule deer, wolverine, mink, Harlequin duck. 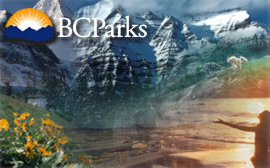 Located approximately 80 kilometres west of Lillooet and 65 kilometres north of Pemberton. There is a management plan being developed for this protected area. For more information please visit the management planning page. Fishing opportunities for rainbow trout are available on the Bridge River and Downton Reservoir. Anyone fishing or angling in British Columbia must have an appropriate licence.